Wiglaf’s not a swordsman at heart. Oh – and the Votes are still really close! Remember to vote every day! :D Thanks again! You guys are double awesome! I love how Gawain’s so calm about it. I’m pretty sure anyone else would be panicking, but Gawain’s all “…well alright then. Movin’ on.”. 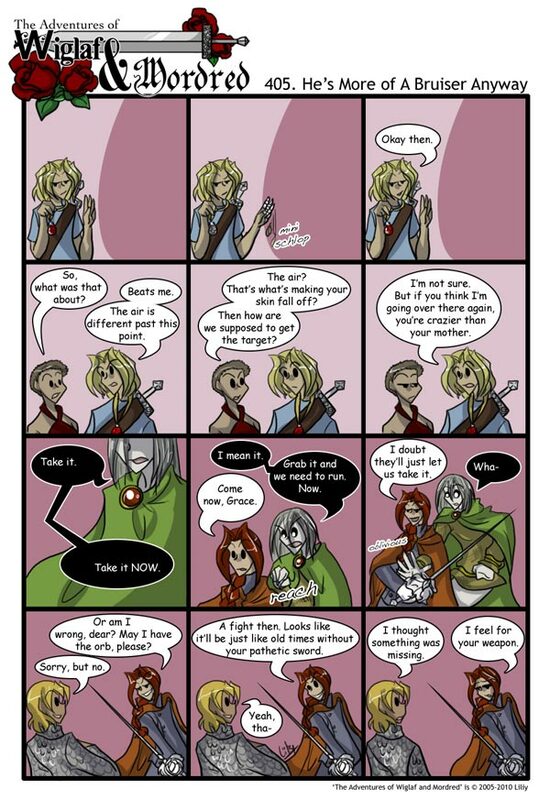 XD And Grace is just love here, especially in his first panel. Hmm… It looks to me like the Orb of Bliss negates magic. So Gawain ‘dies’ when he gets too close. Maybe also Azrael no longer has 98% of Wiglaf’s strength? So he’s going to be embarassed mightily right now? That’s the vibe I’m getting, anyway. Did Grace just stick his hand through Azrael?! He seemed surprised too! If this “negates magic” theory is the truth then, oh my god, what about Security?! …who am I kidding, he’ll be fine. well, does Wiglaf’s strength come from some type of magic, itself? Or does Bliss work more specifically on unholy types of magic? That necklace is what keeps him alive or undead to be precise. Why it reacts that way to the orb shall be an interesting explanation. ’cause Grace is a ghost, not just magic? Or because he’s too powerful to be totally nullified? Either way, I think it’s more of a question as to how Azrael can still see him. OK. Security or one of his ancestors must have made the Orb of Bliss. For Grace and Camlann I can’t peg a creator, but Bliss had to be the fault of the Security Family. He seems to like teasing/tormenting people in subtle and twisted ways. It’s very interesting to see Grace’s hand go through Azrael and how shocked he seems by it. That suggests that the Orb of Bliss is indeed doing something neutralize supernatural forces like Gawain’s zombie body. If so, Azrael’s probably in trouble but doesn’t know it yet. This is getting fun. I almost can’t belive that Azrael called Wiglaf dear. Except it’s very obvious they used to be friends. seriously! i think that’s my favorite part of this page. No wonder Grace hates Bliss so much. I like how you used the backgrounds to show Bliss’s area of effect. Looks like it’s gonna cause Azzy-boy there to get a thrashing though. If Gawain takes Camlann out of his sheath and sticks him in the area of effect, will Camlann scream? Or might it make him shut up? Or will it kill him completely? Mini Schlop is the best sound effect. Just had to mention that.